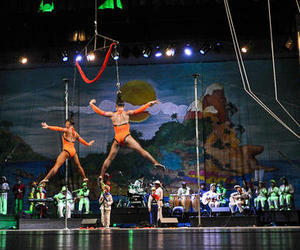 The 14th International Summer Circus Festival Circuba 2015 began with shocking acts by young artists from the Havana Company, in the National Theatre. From beginning to end these performers kept the audience in suspense with their virtuosity, technical audacity and charisma becoming each act in a feast for the senses and a challenge for the steeliest nerves due to the risky performances made very naturally. The gala La Colmenita se va al circo (The Beehive goes to the circus), with children and teenagers of the eponymous theater company led by Carlos Alberto Cremata, put the bar quite high for the tough competition that is going to begin today. The show began with Acrobatic Rope, in which up to four performers, each on the shoulders of the other, synchronously jumped over the rope, or an entire pyramid of young people did the same, mocking the law of gravity and speed. It was a luxury opening for this event, which will run until early September.